The 35th Infantry Regiment Association salutes our fallen brother, PFC Denis Eugene Abbott, who died in the service of his country on April 22nd, 1966 in Pleiku Province, Vietnam. The cause of death was listed as Grenade. At the time of his death Denis was 22 years of age. He was from McConnellsburg, Pennsylvania. Denis is honored on the Vietnam Veterans Memorial at Panel 06E, Line 129. The decorations earned by PFC Denis Eugene Abbott include: the Combat Infantryman Badge, the Purple Heart, the National Defense Service Medal, the Vietnam Service Medal, the Vietnam Campaign Medal and the Vietnam Cross of Gallantry with Palm Unit Citation. 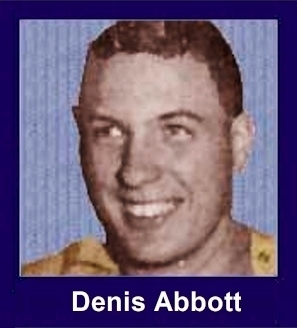 Denis Eugene Abbott, 22, son of Rev. and Mrs. Eugene R. Abbott, North Fourth Street, McConnellsburg, was killed in action early last Friday morning in Viet Nam. He died of wounds received in a sneak attack by the Viet Cong on the camp where he was stationed, near Pleiku. His death marks the first war casualty for Fulton County in Viet Nam where a number of other county youths are now serving. "The Secretary of the Army has asked me to express his deep regret that your son died in Viet Nam on April 22 of metal fragment wounds received when the perimeter of the camp was hit by small arms fire and grenades. "Please accept my deepest sympathy. This confirms the personal notification made by representatives of the Secretary of the Army? The telegram was signed by J.C. Lambert, Major General, USA, Adjutant General. "At the time he was killed, the young soldier had been in the Army just a little over a year, having entered on April 8, 1965. After training at Fort Jackson, he was sent to Hawaii in August, 1965, and then to the Viet Nam area on January 7 of this year. He was a private first class in the 35th Infantry, 3rd Brigade, 25th Division. He had taken part in the Tropic Airlift which won national acclaim several weeks ago, serving as an army vehicle operator." In civilian life, Denis was a quiet, unassuming boy, working in his spare time with the young people in the community. A former boy scout himself he was Cubmaster of McConnelsburg Cub pack 43. He was born in Somersville, NJ on July 15, 1943 and spent part of his childhood with his parents in missionary work in the African Congo. He graduated from the Phillipsburg Osceola High School in 1962 and attended Shippensburg State College from 1962 ?64 as a liberal arts student. He planned to resume his studies after serving his hitch in the army with a view towards a legal or journalistic career. During high school and college Denis showed great interest in dramatics taking part in many plays and joining the National Thespian Dramatic Society. Besides his parents he is survived by three brothers and one sister; Roger 21, now serving the Waynesboro Unit of the National Guard at Ft. Jackson SC, Timothy J. 11, James T. 7, and Linda M. 14 all at home. Mr. and Mrs. Abbott have been informed that their son's body is now in route home from Viet Nam. Funeral Arrangements will be in charge of the Kelso Funeral Home. The services to be held at the Knobville Church of the Brethren in charge of the Rev. Roger Macky of York and the Rev. Gaylord Wright Pastor of the Hyde Baptist Church of Pennsylvania, in which Denis held membership.